Silicon Valley Recycling Firm Seeks Mystery Apple I Donor : The Two-Way The woman donated the computer last month, and it sold for $200,000. The company wants to give her half that sum. 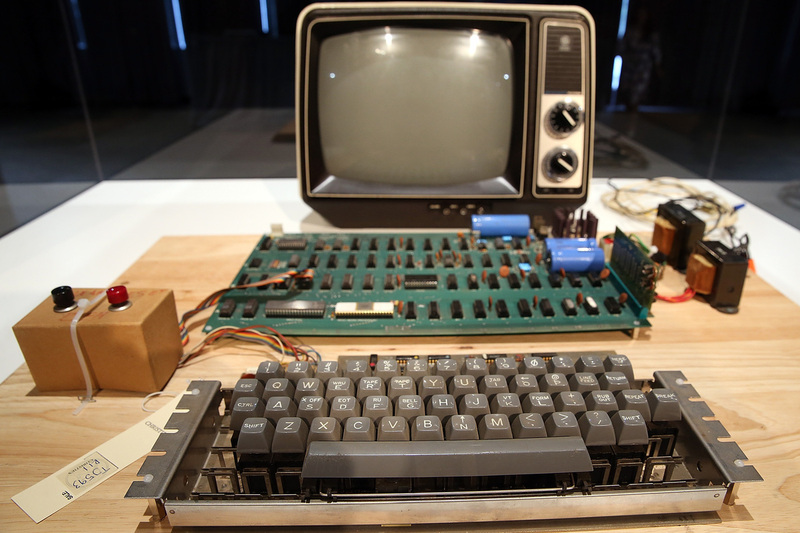 The computer, of which about 200 were made in 1976, is prized by collectors. An Apple I computer, built in 1976, is displayed during the First Bytes: Iconic Technology From the Twentieth Century, an online auction featuring vintage tech products at the Computer History Museum in 2013 in Mountain View, Calif.
Last month, a woman dropped off boxes of electronics to a recycling firm in Silicon Valley; among its contents: a vintage Apple I.
Steve Jobs, Steve Wozniak and Ron Wayne put together some 200 Apple I desktops in 1976 — and the machines are prized. The one in Silicon Valley, for instance, sold for $200,000, the San Jose Mercury News reports. Clean Bay Area, the recycling company, has a policy under which it shares half of the proceeds with the donor. The one problem in this case: The woman didn't leave her name or take a receipt when she dropped off the boxes one Friday in April. "We are looking for her to give her $100,000," Victor Gichun, a vice president for the firm, told the newspaper. He said the woman told him her husband had died a few months earlier. "She said, 'I want to get rid of this stuff and clean up my garage,' " Gichun said. "I said, 'Do you need a tax receipt?' and she said, 'No, I don't need anything.' "
To get her share of the proceeds, the woman needs only to show up at Clean Bay Area's warehouse. Gichun says he remembers her. "I just need to look at her," Gichun told the newspaper. The Apple I is valued by collectors. Two years ago, one sold for $671,400 at an auction in Germany.